You still have a couple of days to enter. You request the free image and make a christmas card and link up your project and you get next month's image. 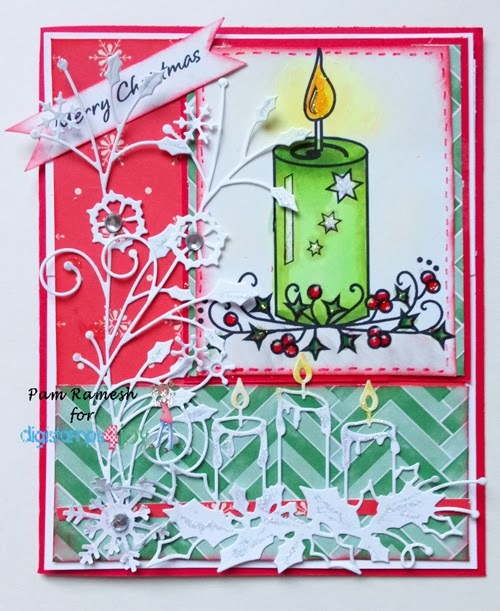 Great way to stay ahead of Christmas card making instead of last minute rush. I am off to link up my card, Hope you do too. Pam this is a wonderful Christmas creation with great details. Just love all the beautiful dies. Thank you for taking the time to use this month’s free Christmas image. You have automatically qualified to receive next month’s Christmas image for free, which will be emailed to you at the beginning of February. OMG, Pam! Love the candle dies!